Summary: I damaged the spindle mount on my BIC 960 by turning the platter by hand before I realized I was destroying the spindle friction-fit in the base. This can be repaired by using a center punch to make the hole smaller again. To make the spindle fit tightly in its base again, you need to make the hole in the base smaller. Turning the platter while the spindle was frozen to it destroyed the original friction fit. The tool steel spindle is much harder than the sheet steel base and the hole was mashed out of shape as the spindle turned. 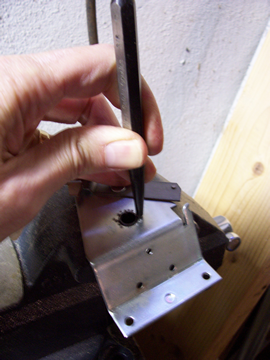 Making the hole smaller again means forcing some of the base metal towards the spindle. You will do this by making small dimples in the base with a center punch. By placing the dimples close to the spindle and encircling it, you will displace some of the base metal and cause it to press against the spindle. This will restore the friction fit and make your spindle assembly as good as new. You need a good support for this operation. A solid, heavy vise works well. Protect the spindle bearing surfaces by wrapping them with tape. Electrical tape works well. Open the jaws of the vise enough to let the spindle barely pass through. 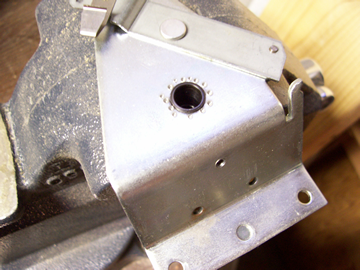 Place the spindle assembly into the jaws with the spindle hanging down. Do not tighten the vise jaws. Pick any spot around the spindle for the first punch. Place the tip of the punch close to the spindle so the dimple will do its job. Tap the punch firmly with a hammer. You need to hit it hard enough to make a decent dimple, without really distorting the base. A dimple that is about 1 mm in diameter is fine. For the next dimple, move the punch to the opposite side of the spindle. Place the third dimple a quarter way around the spindle, half-way between the other two. Do the fourth dimple on the opposite side. Test the spindle. It should feel a bit less loose on the base. Continue making dimples in this fashion until you have made 12, all spaced roughly equal distances apart around the spindle. The reason for the criss-cross pattern is to keep the forces on the spindle roughly in balance. This will move it as close as possible to its original location in the base. My dimples were not quite evenly spaced because I was trying to determine the correct dimple placement experimentally. Putting the turntable back together is mostly just the reverse of disassembly. Put the spring back on the cam follower arm. 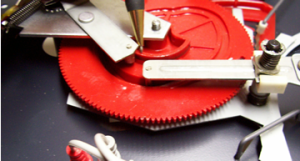 Rotate the red gear slightly to align the large gap in the gear teeth with the hole for the spindle. When you reinsert the spindle base, be sure the cam follower post is on the outside edge of the innermost cam on the red gear. Pull the cam follower arm away from the spindle base to put the follower into the right position. Reattach the nut to the gear shaft. Attach the spindle base to the platform with two screws, remembering to include the green ground wire. Reattach the wiring bundle to the spindle base. Set the turntable base nearby so you can place the platform back on the base. Loosen the screws clamping the platform to the work stand. Remove the wood blocks. Remove the turntable from the stand and set it on edge on the base. Work the wires through the holes in the clear plastic bottom. Put the platform in place on the base, pulling the wires the rest of the way through. Put the ball-bearing parts back on the spindle. Select a washer and orient it so the shiny bearing wear pattern is up. Place it onto the spindle and drop it into place. You might have to wiggle it a bit to get it to clear the gap in the red gear teeth. Apply a small amount of lubrication to the bearing ring and place it onto the spindle next, with the flat side down. I am not sure what the best lubricant would be, but I used a spray-on product called 711. WD-40 could also work, or even a drop of motor oil. Place the second washer on next, with its wear track facing down. Finally, drop the black O-ring onto the spindle. One side will have indentations in it from the teeth on the platter sleeve. Place that side up. When the ball-bearings, washers and O-ring are in place, swab a bit of lubricant around the bearing surfaces of the spindle. Do the same inside the sleeve on the platter. Place the drive belt on the platter, around the drive ring. Holding the belt in place with one hand, slide the platter back onto the spindle and loop the drive belt over the drive pulley. This would be a good time to do a power up check to confirm that the platter spins and the automatic tone arm function is still OK. 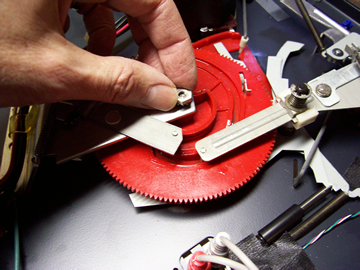 If all is good, reinstall the circlip, record spindle and platter pad. If your BIC turntable is stuck, the best solution may be heat. Many visitors have commented that a hot soldering iron loosened the old grease fastest. The consensus is to remove excess solder from the tip of a low-wattage soldering iron and use it to melt the grease. A pencil type like the Weller WLC100 works well. First remove the parts that could melt easily, like the plastic circlip and rubber pad. You can clean the tip by wiping it on a moistened sponge, like the one included with most soldering stations. Then put the iron into the opening in the spindle. Let is sit for ten to fifteen minutes so it can heat the spindle shaft. When the grease has softened, the platter will lift off easily. From there it is a simple matter to clean out all the old grease and apply a new lubricant. Ray – I have a similar issue. The spindle hasn’t come out but is slightly bent – I just bought a 980 from a yard sale. It’s not in bad shape now I’ve freed up the platter and got it off. but the issue is that someone tried pulling the platter up from the back and bent the spindle so the turntable is not level. Any ideas on how to center it again. I’ve used washers to try and get it in line. It now works but is still now level (higher at the back than front). Any ideas would be great. Thank you. Great articles by the way.